FILE - In this 1998 file photo made available on March 19, 2004, Osama bin Laden is seen at a news conference in Afghanistan. For many, the whereabouts and machinations of al-Qaida founder Osama bin Laden following the Sept. 11, 2001, terror attacks until his death remain shrouded in mystery. The terror mastermind had been on the run, trying to evade U.S. forces, while al-Qaida itself was in a period of disarray. Yet even as U.S. Navy SEALs burst into bin Laden's compound in Abbottabad, Pakistan, in May 2011 and killed him, things already had begun to change with the help of officials in Iran and Pakistan. 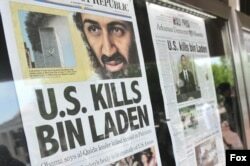 FILE - Front-page headlines that announce the death of al-Qaida terror leader Osama bin Laden are seen at the Newseum in Washington, May 2, 2011. "It's a very, very crucial period that always has been overlooked and misunderstood," said Catherine Scott-Clark, co-author of the new book The Exile: The Stunning Inside Story of Osama bin Laden and Al-Qaida in Flight. There have been some prior insights into bin Laden and al-Qaida during his years on the run, including the release by U.S. intelligence of three tranches of documents recovered from the Abbottabad complex. But many more remain classified. Those documents, according to U.S. officials, give insights into a paranoid jihadist, hoping to prevent al-Qaida from falling apart. "The movement is nothing like unified. It disagrees with itself all the time," a senior U.S. intelligence official said of the second set of declassified documents, most of which date from 2009 to 2011. "You got to see the mess it was behind the scenes." But Scott-Clark and co-author Adrian Levy tell a more nuanced story of bin Laden's exploits, relying on testimony from his family, his deputies, his spiritual adviser, and others with links to the al-Qaida network. "He was active and ambitious and happy that al-Qaida was on the up and coming back, and money was flowing through and the affiliates were kind of getting under control and doing what he wanted them to do," Scott-Clark told VOA following a discussion Monday at the Brookings Institution. "Things were continuing. It was business as usual." Scott-Clark attributes much of that success to alliances bin Laden had forged with some current and former officials in Pakistan's Inter-Services Intelligence, or ISI, although she emphasized that key officials were kept in the dark. FILE - A resident walks past the compound where U.S. Navy SEAL commandos killed al-Qaida leader Osama bin Laden in Abbottabad, May 5, 2011. 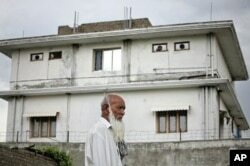 Pakistani authorities have denied that any officials had any knowledge of bin Laden's whereabouts. Scott-Clark said that the information was closely held. "Not everyone has the same level of knowledge and people did not share information," she said. "If you look at the fallout after the killing [of bin Laden] and the way that the army and the ISI reacted by just shutting everything down, they were as shocked as everybody else." Perhaps more important, bin Laden and al-Qaida got a boost from Iran — an unlikely ally that kept several family members, including some of his wives and his son, Hamza, as well as key members of al-Qaida's Shura, or ruling council, held at a Quds force training compound in Tehran. After an offer was reportedly rebuffed to hand over the family and al-Qaida leaders to the U.S. or other Western nations in exchange for an easing of sanctions, Tehran took a more proactive approach and "negotiated with al-Qaida to mutual benefit." "It was a fraught relationship, from the people who were in Iran from al-Qaida that I interviewed," Scott-Clark said. "It went up and down all the time, and there was complete mutual distrust on both sides for the whole time that they were there." But both sides, she said, were able to get some of what they wanted. Iran was able to use al-Qaida and al-Qaida in Iraq — the forerunner of Islamic State — to create problems for U.S. forces in Iraq. And bin Laden and al-Qaida were able to reinvigorate the group's networks, setting up a comeback that has yet to abate. "They were able to re-establish a funding pipeline through Iran which still exists today," Scott-Clark said. "These days, the money comes from Kuwait and Qatar and goes to Syria and Iraq. A lot of it used to go to Pakistan." Yet divisions with al-Qaida remained. Bin Laden, enamored by the Sept. 11, 2001, terror attacks, wanted "to fight a physical war. He wanted the bigger bangs," according to Scott-Clark. That vision seems to have died with bin Laden, Scott-Clark says, and was replaced by that of his former deputy and current leader Ayman al-Zawahiri, who sees al-Qaida as a means for inspiration. "I don't think al-Qaida Central is going to carry out a sort of coordinated home-based mass attack. I think those days are gone," she said. "It's all about PR [public relations]."